Sever J. Voicu is Scriptor Graecus at the Vatican Apostolic Library and Guest Professor at the Augustinian Patristic Institute in Rome. 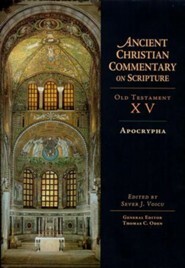 He has published mainly in the area of Greek Patristics and New Testament Apocrypha. "Get a better understanding of the Apocrypha from an ancient perspective with the Apocrypha volume of the Ancient Christian Commentary on Scripture! I'm the author/artist and I want to review Apocrypha - eBook.